With the recent integration of GetSatisfaction.com all members of Tomoson can now vote on new features being built on Tomoson. Simply click on the icon shown below to view, comment, and vote on your favorites. Members can even submit their own ideas and have the community vote on them. We are looking to make Tomoson a useful tool for bloggers and promoters alike so tell us what you are looking for. 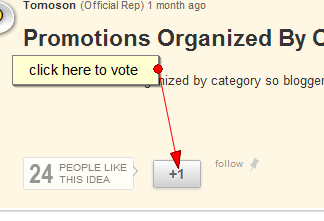 When you click on the feedback button on Tomoson use the ideas tab to submit your new ideas. Once you submit them share it on facebook, twitter and where every you want. When you click on each idea there is a 1+ icon shown on the page. Click that icon to add your vote to the idea. You will also be able to comment below each idea on ways to make it better. We’re looking forward to your feedback on the new features we have planned and what features you come up with.